DON'T MISS YOUR CHANCE to spend the night at the most beautiful place in the city! 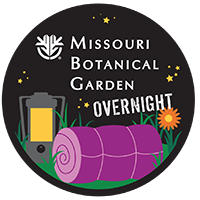 Spend a fun-filled evening becoming a botanist while dissecting flowers, going on a flashlight tour of the tropical Climatron and playing in the Children's Garden all night. Scouts will sleep in the Brookings Exploration Center, right beside the exhibits. This is a unique opportunity for scouts to work toward badge requirements while having the Garden to yourself! Scouts will also receive a one-of-a-kind souvenir patch for participating, too. One chaperone per five scouts is required, but groups may register as many as they would like. Can’t make any of these dates? Check out our Overnights at the Shaw Nature Reserve or schedule an overnight experience of your own creation at Shaw Nature Reserve's Dana Brown Overnight Center.